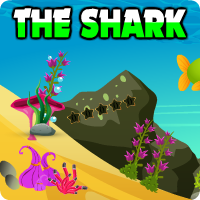 AvmGames - Avm The Shark Escape is another point and click escape game developed by Avm Games. The Shark Escape game is in which the action takes place underwater. A shark was swimming and he found a sunk submarine. He was very curious about it and entered to explore it. Unfortunately while he was inside, a shark passed by and slammed the submarine door. The door got stuck and now the shark is trapped inside. In order to survive, the shark needs help to escape from that submarine. Explore inside the submarine for some useful clues and help the shark escape. Good luck and have fun! Don't forget to take everything when you solve a puzzle, like the crowbar when you place 4 crabs. Axe and cutters for s5. That's 'first' crowbar. You'll get another one soon. Sneaky jellyfish behind mushroom in s3. Grey stone for rock in s6. You're way ahead of me now AO, lol! Where is 96315 used if not in s4? I am stuck. Where is scene 4? and Alpha your S4-5# hint??? Not making any sense. I can't find any crowbars or hints for the words, 4 colours etc.